I don’t quite understand why, but there seems to be a conspiracy of confusion surrounding the promotion of the new series of Getting On, which (in case you’re curious) starts this Tuesday (26th) on BBC4 @ 10pm. My TV listings magazine had a two-page interview with Jo Brand, but simply stated that the new series would start “later this month”. Helpful! While one online magazine’s “recommendation” for the show claimed that it starts “from the 23rd onward”, which is straight-up wrong. Still, there is a great interview with Joanna Scanlan at WalesOnline, talking about how her many previous nurse-y roles inspired her character… and a neat feature on the three main cast-members/writers at The Guardian, which gives a little insight into the creative process behind the series. For all the talk surrounding Brand’s nursing experience, it was interesting to learn that Vicki Pepperdine‘s parents both worked in the NHS too… so all three have some personal connection/relationship with the subject matter, even if Scanlan’s is mostly based on her frustration at perpetual typecasting. It’s funny that they try to correct the general “misconception” that the series takes place on a “geriatric ward”, when the BBC’s own site states it quite specifically. Ah well… the article also gives Coming Soon a plug, which is always appreciated. I repeat: Series 2 of Getting On starts Tuesday 26th October on BBC4 @ 10pm, and runs for a full six episodes this time around! 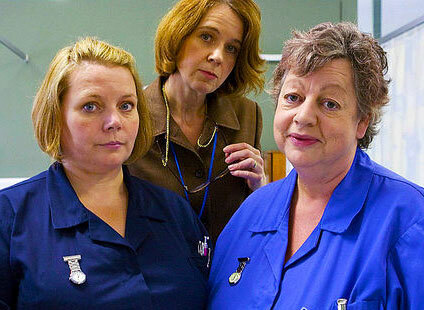 This entry was posted in Rants about TV and tagged Coming Soon, Getting On, Jo Brand, Joanna Scanlan, Vicki Pepperdine. Bookmark the permalink.